I’ve been meaning to make this post for months and when I wanted to share the recipe with a friend, I decided I should finally just blog it for everyone! Being a Texan can make it difficult at times when it comes to eating vegan. While I’ve really lost my taste for meat in the last year, I occasionally still miss eggs and cheese, and breakfast tacos are probably the thing I long for the most. Fortunately, I’ve learned how to make a pretty darn good vegan substitute for my favorite kind of breakfast taco: chilaquiles. As proof, Scott willingly ate them for lunch today (although he did top them with real cheese, lol). If you are doing Kathy Freston’s cleanse, these are approved as they are gluten free as well. 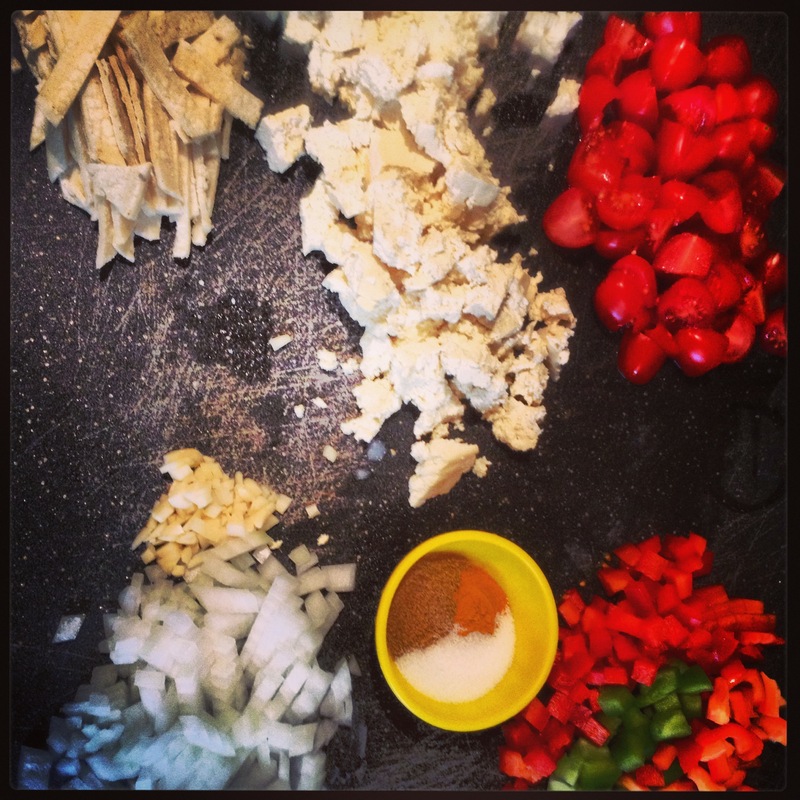 This recipe can be modified too, depending what you like in your taco. You can always add or subtract ingredients. Additional ideas not listed here could be black beans and/or jalapeños, but really the sky is the limit! Go crazy and add some mushrooms or spinach! Seriously, anything goes! Also, I’m sure a regular pot or pan works just fine, but I always make my tacos in cast iron and they turn out great. And although they aren’t listed in the ingredients lists below, don’t forget the tortillas for your tacos! I’ve been getting some really tasty vegan flour ones made by Paqui that I found at Whole Foods (I like the Cilantro ones – they are green, although today I just used plain corn). The “egg” needs to be a spouted tofu. 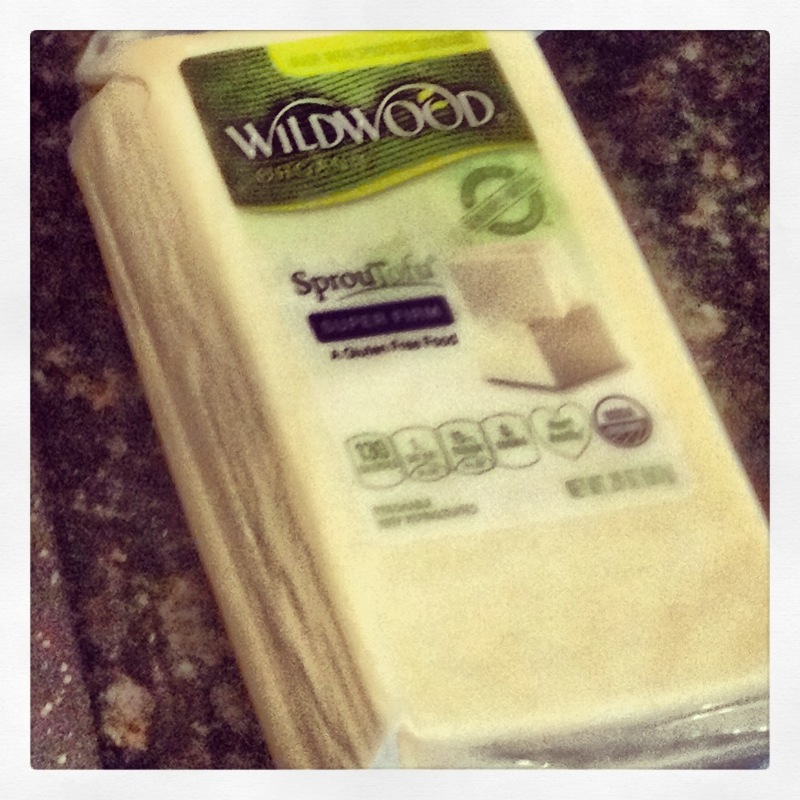 I use the brand Wildwood SprouTofu from Whole Foods and get extra firm (in the Blanco store in SA, it’s near the other refrigerated tofu, also by vegan sour cream, salad dressings, etc., kind of across from the milk). Unless I’m making a ginormous batch, you really only need 1/3 to 1/2 of the block at a time. I cut off as much as I think I’m going to need and crumble it up into pieces (see the white crumbles in the picture below – it kind of looks like feta). This morning I used ~6oz which is approximately two servings of tofu (28g protein). To get the classic “crunchies” of a chilaquiles taco, simply slice up a corn tortilla into thin strips and fry it in some oil (today I used olive but you can also use vegetable or canola). This morning I only used one tortilla and 2 Tbsp of oil. Heat the oil and drop in the pieces when it’s nice and hot (they should immediately sizzle). Let them turn a light golden color and remove from the oil quickly (I put on a paper towel to soak up excess oil). Save the oil from the pan. Next, you will need to prepare the rest of your ingredients (for the amounts, just gather as much as you think you will like, it’s not an exact science, more personal preference). You can get an idea in the picture how much I used but basically a handful of everything except garlic (which was just a couple of teaspoons probably). I do about equal parts of cumin and coriander (this morning I did about 3/4 tsp of each), a 1/2 tsp of salt, and a heaping 1/4 tsp of turmeric. Again, just kind of eyeball it and you’ll find out what works best for you. Now that you’ve fried your tortilla strips and have gathered the rest of the ingredients that you’ll need, you’re ready to get cooking! I recycle the oil leftover from frying my tortilla strips and start off sautéing the onion and garlic for a few minutes. Next I add the bell peppers for a couple minutes longer and then the tofu crumbles, stirring as I go. Once nicely mixed together, I sprinkle in the seasoning, coating the mixture evenly. If you use turmeric (which is really good for you! ), your tofu will turn a nice bright yellow color (kind of like real eggs, haha). Once it seems like everything is evenly mixed and heated through (a couple of minutes), I add the tomatoes last. I continuously stir my pot and within another minute or two it should be good to go (I don’t like my tomatoes to be too cooked in these tacos)! 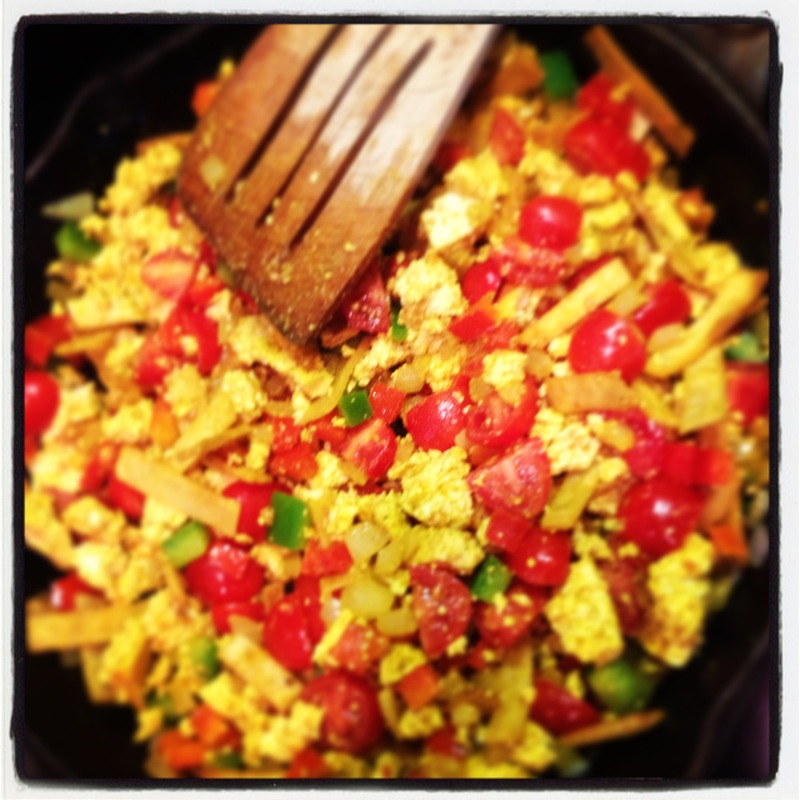 Simply scoop the mixture onto a warm tortilla of your choice and top with your favorite toppings! 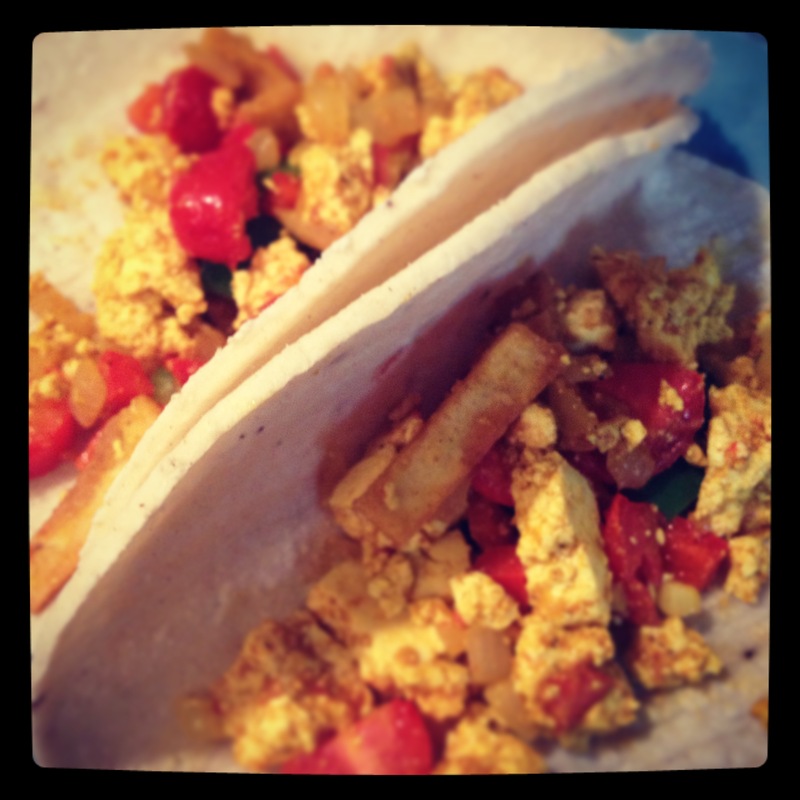 Enjoy a delicious and alternative to the classic breakfast taco! If y’all end up trying it, let me know what you think!